Virgin rail workers are taking part in a 24-hour strike, in the first of a number of walkouts across the UK. 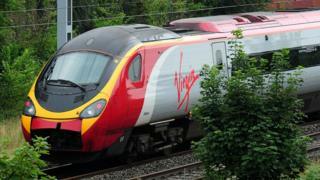 Rail, Maritime and Transport union and Transport Salaried Staffs Association members on Virgin Trains West Coast are striking over pay and staffing. Virgin said it had offered a "significantly above inflation pay rise", but unions rejected it. Most Virgin West Coast services will still run, but Chester and north Wales will not be served for most of the day. A replacement bus service is running between Chester and Crewe. Arriva Trains Wales has also suspended trains between these stations because of flooding on the line. This service is expected to resume at about 16:00 GMT. Virgin West Coast trains will not serve Edinburgh, but this station can be reached via other train operators' services. Passengers have been warned to check their travel arrangements before heading to the station and to expect the services that are running to be busier than normal. Virgin Trains says if trains are cancelled as a result of the strike, tickets can be used on the service before or after. It added tickets would be accepted by most other train companies and would also be valid for the day after the strike. Further strikes are planned on Virgin West Coast services on 22 December and throughout January. RMT members are also staging action on Merseyrail, Greater Anglia, South Western Railway and CrossCountry rail in the coming weeks. Why are the unions striking? Both the RMT and the TSSA said the dispute is over drivers being offered higher pay rises than other staff on the network. Manuel Cortes, general secretary of TSSA, said: "We're obviously happy for the drivers that they have had a decent settlement, but our members believe that they too should deserve a little more than a stand still inflation pay rise." RMT general secretary Mick Cash said: "We have made it clear to the company that the inequality and underhanded approach of Virgin will be fought tooth and nail." Phil Whittingham, managing director for Virgin Trains on the West Coast, said the company had spoken to the unions about a 3.6% pay rise - but they want 4%. He claims that is double the 2% national average seen across the UK this year. "We remain open to talks with the RMT and TSSA, and urge them to call off these strikes which will cost their members pay for no gain," he said.